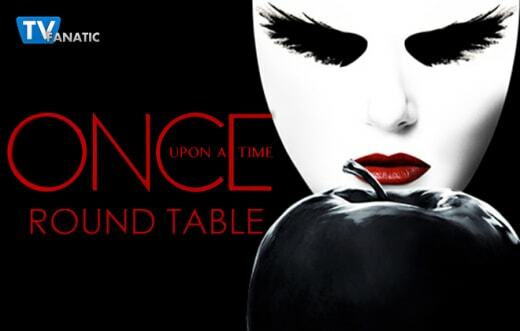 Once Upon a Time Round Table: Is RumBelle Really Over? The newest Dark One cast his own curse and crushed Merlin in the process... Belle walked away from Rumplestiltskin... and Henry tried to remind Emma of who she was in Once Upon a Time Season 5 Episode 10. Below, TV Fanatics Jim Garner, Robin Harry, Christine Laskodi and Amanda Steinmetz are joined by Teresa from Once Upon a Fan to debate Zelena’s future, Belle and Rumple’s relationship and why all the Dark Ones have converged on Storybrooke after "Broken Heart." Do you think that the baby will change Zelena the way Henry eventually changed Regina? Jim: That seems almost too obvious. Maybe a threat to the baby (like a bunch of dark ones) will start the change, but I doubt the exact thing that helped Regina will fix Zelena. Teresa: Not entirely sure. 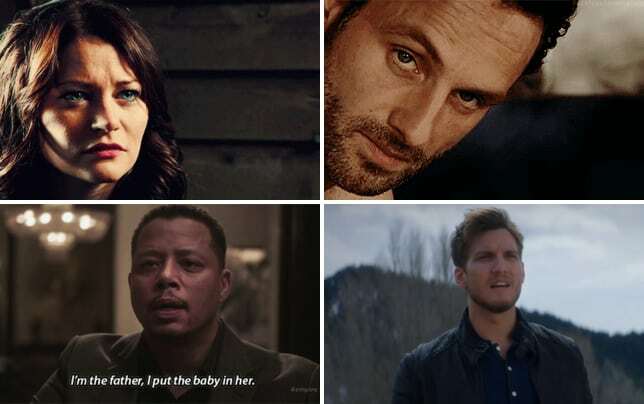 I think more than anything it won't be the baby that changes Zelena but rather Robin and Regina's choice to reach out to her, even though she does not deserve it. Their willingness to take a horrendous situation and salvage some good out of it is likely something she has never before encountered and may change her perspective. Robin: I'm inclined to think that it will. That's been a running theme on this show: Regina and Henry, Maleficent and her daughter. even Emma and Henry. At the very least, Zelena may be less envious and learn how to put the greater good ahead of her own interests once in a while. Christine L.: I just don't know. Zelena is selfish and conniving, but she's so driven by envy. She's finally got something that she doesn't have to be envious of, so it's possible that the baby will SOFTEN her. But change? 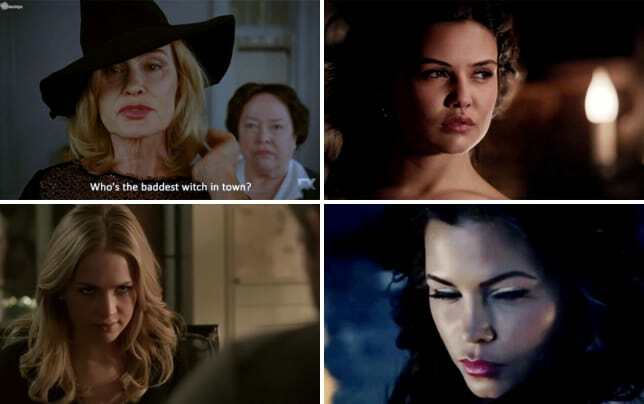 I think there's a lot of deeply rooted evil aspects to Zelena for her to completely change...at least for now. Amanda: Perhaps, but it'll take time. It looks like she's sticking around, so there is plenty of time for a redemption arc. I'd actually like to see her stay evil. Not every villain needs a redemption arc. Is Belle really done with Rumpelstiltskin? Jim: Of course she isn't! Why else would she go out to the well. She's confused for sure, but done... not a chance! Teresa: I agree with Jim. Moreover, it seems to me that the decision to have Belle stand on her own two feet now instead of in the second half of Once Upon a Time Season 4, when it would have made more sense, was fueled by Emilie de Ravin's pregnancy and the intent to keep it out of the plot, rather than a desire to state the character's "final answer." Robin: I also agree that she's not really done, especially now that Rumple has supposedly actually become the hero she knew he could be (I still don't get that but whatever). I do think that it's more than overdue that she took some time away from him to heal her own heart. Christine L: Not a chance. Belle's story with Rumple is far from over, though I do really like her coming into her own and standing up for herself and what's best for HER for a change. Amanda: Not at all. What would she do otherwise? The girl has no storyline of her own. Hook crushed Merlin’s heart? Can he come back from that? Jim: We can only hope. I'm confused by a couple of things on this. First, if Merlin was the strongest light magic, how did Hook even get his heart, and then if Merlin was immortal, would crushing his heart really kill him? Teresa: Perhaps? Murder in cold blood is almost always the unforgivable sin. On the other hand, Regina and Rumple have both been guilty of the same crime and been able to find redemption. But like theirs, Hook's journey will need to be lengthy and developed adequately to have credence. Robin: For sure he can. Regina's come back from worse, not to mention Rumpelstiltskin's now a hero. There's also the fact that Hook didn't choose to become the Dark One, and has obviously lost control of himself to the host of Dark Ones inside him. If anything, it's going to be easier to redeem Hook or absolve him of responsibility than any other villain on this show. Christine L: I think so. Merlin isn't the first person whose heart was crushed by Hook. (In the literal sense at least.) Hook has walked that redemption road once before, and while this time it might be harder, I have no doubt that he'll do it again. It's the Dark Magic, not Killian. He and Emma will both have a lot to answer for and they'll do it together. Amanda: I don't see why not. Regina and Rumple have done worse. I agree that it probably makes a difference that Killian didn't choose to be a Dark One. What I don't understand is why Killain got so dark so quickly as opposed to Emma. Is it because he already had a history of darkness? Why bring all of the Dark Ones to Storybrooke? What’s your theory? Jim: Well, for evil it's a chance to snuff out the light. However for the light side, it gives Emma a few more choices to bind her's and Hook's evil into that nobody will mind if is cut down with Excalibur. Teresa: I think it's to bring about the ultimate showdown. Nothing like an Army of Darkness to rally the forces of Light. Robin: I'm not really sure, apart from the whole "snuff out the Light" spiel. I think that this broken, dark version of Hook wants to make Emma hurt as much as he's hurting, so he's probably going to go after her family. Man, Hook and Emma have faced more obstacles in their few months together than Snow and Charming have in years. Christine L: Like everyone else basically said, I think it's a showdown. Dark vs. Light. Though, I don't really think that either can prevail. Both sides need the other to thrive. Amanda: I think the purpose is fairly straight forward. The dark wants to snuff out the light. Plain and simple. Was there anything in “Broken Heart” that disappointed you? Jim: The "loop hole" that let Hook cast the curse to send them back to Storybrooke. Seemed a bit contrived, like the writers came up with the entire storyline and then went "wait, how could the curse get cast with the characters we have?" Teresa: The melancholic tone of the episode disappointed me. Has it been futile to look for Hope this season? That was the feeling I got after hearing Hook's brutal words to Emma and witnessing Rumple's abrupt rejection by Belle in the very moment he legitimately earned his second chance. But then, there is still the Winter Finale which has potential to turn things towards a more positive direction. Robin: I was disappointed that Hook was so unreachable so fast - I mean, it made sense, but it was still hard to watch. Christine L: I agree with Robin. It's really disappointing that Hook changed so quickly. Emma still seems to be Emma even as the Dark One, so to watch how drastically it's changed Killian is a little odd. Perhaps because of the former "evil" aspects of himself he was more susceptible? Amanda: How quickly Killian went evil. It just seemed to all happen way too fast. What was your favorite quote or scene from this episode? Jim: I have to go with the one where I actually laughed out loud. That being Regina's "Captain Dark One" reference to Hook.. She always has the best references for people. Teresa: I loved the scene where Henry reminded Emma of who she is, and the launch of Operation Cobra, Part Two. That is the heart of the show and I was happy to see it highlighted. Robin: Hook and Emma's arguments when he became the Dark One. Those were so intense. Hook was so despairing, knowing how hard it was for him to fight the little darkness he already had, and he was so furious with Emma for assigning him this fate that he didn't want, and even worse, for lying about the dagger and losing faith in him. Then later on, in the field of flowers, when Emma said "I love you" and he stopped and said, "usually I have to say that first." Man, that killed me. Christine L: Definitely Henry and Emma. That's the magic that makes Once Upon a Time. This kid with a big heart who believes in a huge story, and he's doing his best to make everyone else believe in it too. I loved the writers bringing that back. Henry and Emma's relationship, to me, is the heart of this big fairytale. Operation Cobra forever! Amanda: Definitely the scenes between Emma and Killian. Their fights felt so raw and personal. They are certainly at their lowest point. 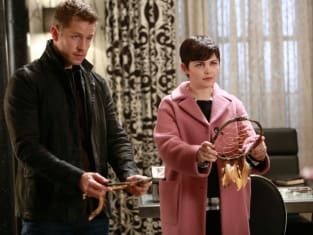 Check back in on Sunday for our review of Once Upon a Time Season 5 Episode 11 and if you want more magic now, you can watch Once Upon a Time online here at TV Fanatic. We save each other. That is what our family does. Permalink: We save each other. That is what our family does. Henry: The minute things got tough, you didn't come to anybody. You decided that you would figure it out on your own. We were a team. Emma: Operation Cobra. I remember. Henry: But now, you just want your dark magic back so you can do it alone. Permalink: But now, you just want your dark magic back so you can do it alone.